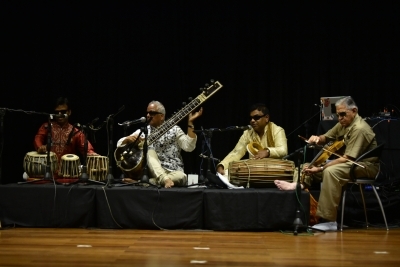 New Delhi Sep 16 (IANS) Music is not just for the sighted as it stems from the body s rhythm visually-impaired multi-instrumentalist Baluji Shrivastav said at his performance "Antardrishti: Inner Vision" at the British Council here. The Indo-British musician was appointed the Officer of the Order of the British Empire (OBE) -- a Queen s honour -- for his services to music in 2016. Uttar Pradesh-born Shrivastav who has been visually impaired since he was 4 said he grew up listening to his heartbeats and the flow of his blood. "I could feel my heart is thumping and so is everybody else s and that was the metre of music for me " he told IANS on the sidelines of his performance elaborating on the inner vision he developed. "Music itself is not designed only for sighted people but the whole being " he said adding that everything is music for him. "You re speaking I m speaking. That s also music." His two-hour group performance last week essayed the eleventh chapter of Bhagavad Gita which carries the essence of the epic Mahabharata through music dance and audio-visual media. "I was excited to choose Mahabharata because of Dhritarashtra who himself was blind. The eleventh chapter of Gita because it s here when Lord Krishna shows his Vishwaroopam (grand avatar) to Arjuna and makes him look beyond the obvious" the master sitarist explained. The 67-year-old artiste who has been away from India for over 30 years seems to be equally fluent in Hindi and English and recites Sanskrit couplets with ease. The widely-heard musician said that his father taught him one Gita Shloka (Sanskrit verse) each day when he was young. "It took me few years to learn the entire Gita by heart now I can recite it fully " said the Baluji Music Foundation founder. He has also founded the Inner Vision Orchestra UK s only blind ensemble -- which performed with him -- the idea for which occured to Shrivastav when he was learning at the blind schools in Gwalior and Ajmer. As his Orchestra played striking music at the British Council here it was accompanied by the graceful gestures and body movements by an Indian classical dance group headed by Arunima Kumar -- all feeding into a beautiful recital of Gita s 11th chapter "Vishwaroopam Darshana". The performance held the audience s attention as an audio-visual accompaniment played street sounds -- that of a coconut being cut a street being swept and food items being sieved -- to which the ensemble played the tabla sitar flute piano and violin. It was produced by Baluji Music Foundation with support from Arts Council England British Council and PRS Foundation. Towards the conclusion of the performance a poignant Shrivastav said it s a misconception that visually-impaired music artistes cannot play for a dance performance. As British Council s North India Director Tom Birtwistle put it the performance celebrates the "equal contribution made by differently-abled people to communities". For Shrivastav music also remains a way to instill confidence in the visually impaired community. Mentioning his India tour which concludes next week he also said the joy of coming back to his motherland remains unparalleled. In his usual style the musician broke into a Sanskrit shloka to illustrate his point: "Janani Janma-bhoomi-scha Swargadapi Gariyasia" translating it to explain that mother and motherland were better than heaven. His next performance is scheduled to be held at the Royal Opera in Mumbai on Monday.